Continuous spiral flight is a component in screw conveyor. Generally a screw conveyor consist of continuous spiral flight that is bonded to a shaft in a pipe. Screw conveyor usually used for transfer granular material such as asphalt, coal, ash, gravel and sand. Using screw conveyor you can take out your material in some point. This is important for granular, hot and smelly material. 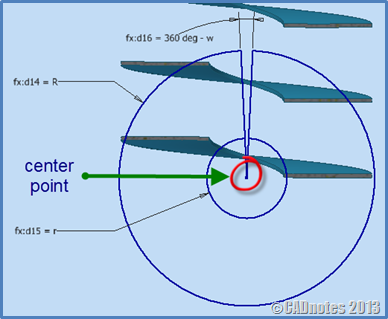 There is a problem when you need to determine flat pattern of the continuous spiral flight. 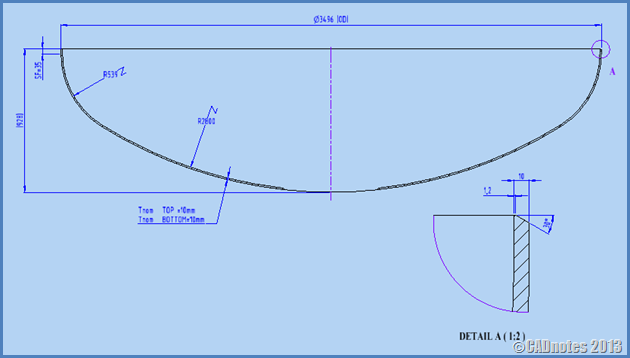 In Inventor, there is no tool to create flat pattern from this part. However, we can create flat pattern manually like the article I post before: Creating Flat Pattern Using Inventor Derive Tool. Here, I want to create flat pattern using general equation and create little modification to automate our continuous spiral flight design. 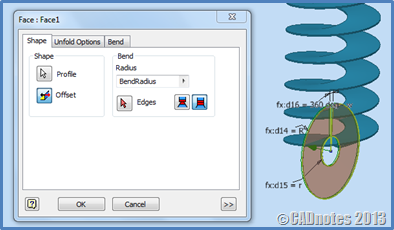 Unlike previous article, I need two file that contain folded and flat pattern model but in this article I will create folded and flat pattern model in one file. I also can activate one of them by iLogic. Let’s start with creating basic sketch of continuous spiral flight, use Sheet Metal(mm).ipt in order to work in same unit. Create sketch in YZ Plane, always consider to start your sketch from center point. 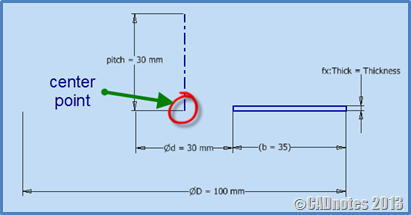 Define the parameters like picture shown, you can highlight the dimension, right click and choose dimension properties. Next step is to add User Parameters to help us create flat pattern equation. Click Parameters tool located in Manage tab Parameters panel. Create additional parameters like the picture shown below by clicking Add Numeric for parameters that contain numerical data and Add Text for add parameter that contain text data. In this file, we only use Add Text for parameter “active” and it has two values, those are flat pattern and folded part. Click Done button when finish. Click Finish Sketch tool located in Sketch tab, Exit panel. Next step is to model this sketch using Coil tool located in 3D Model tab Create panel. 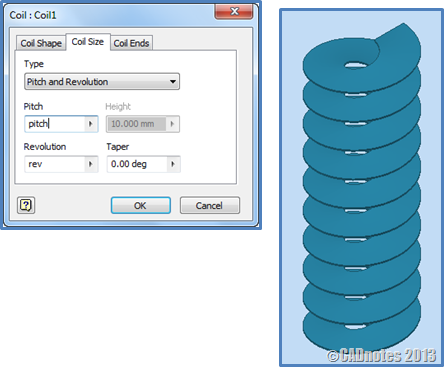 Click Coil Size tab, ensure you use Pitch and Revolution in Type option to create your coil model based on pitch and amount of revolution. In Pitch box, write “pitch”, the value refers to your User Parameters. In Revolution box, write “rev”. Click OK button to finish your model. Let’s create flat pattern sketchon YZ Plane, slice the graphic using F7 button from your keyboard. Create the sketch, add horizontal constraint in the end of line that touches the arc of circle. 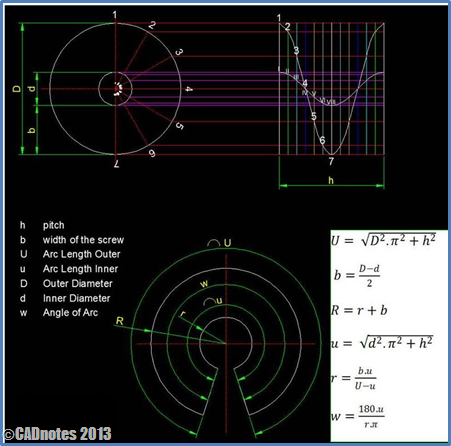 Create dimension, input your outer circle with parameter “R”, inner circle with “r” and input angle with “360-w”. Next, remove arc between lines that we don’t need using Trim tool. Last, click Finish Sketch tool. Next is to extrude the sketch using Face tool located in Sheet Metal tab Create Panel. Click OK to finish the instruction. Now we have folded and flat pattern model. I want my model can switch from folded to flat pattern model or vise versa. I also want when I need to change the dimension of my continuous spiral flight, I can easily control dimensions of the model. So I need logical code and form to build my design. Inventor accommodates that with iLogic. So please let me show you how we can automate design using iLogic. I need a form to control parameters that we have created before, click Forms tab and then right click in Forms area, click Add Form. 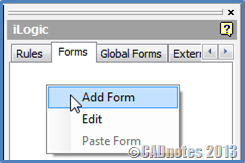 Form Editor Dialog Box will appear. Give the form name as Continuous Spiral Flight. Use OK Cancel Apply in Predefined Buttons. Add Tab Group and give the name like the picture shown below. Now you can add parameters by dragging parameter in Parameters tab to Label area. 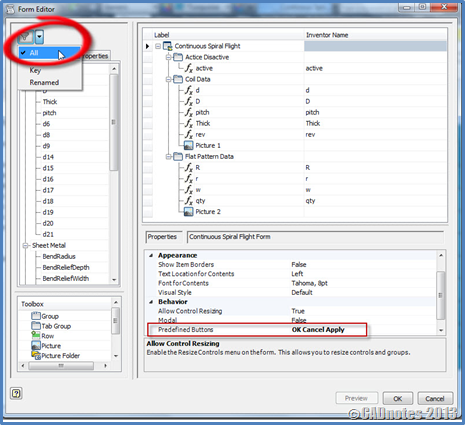 If your parameters disappear, make sure your parameter filter is check to All option. If you want your form have a picture, you can add picture. Click OK button when finish. Note that your “active” parameters are not functioning yet. We need add iLogic to make the parameters to work. Also I need to avoid my design from error that may happened if user input wrong value to the parameter. For example when user input “d” less than or equal to 0, “D” less than or equal to “d”, “pitch” less than or equal to “Thick” or if “ rev” less than or equal to zero. Let’s add rule by clicking Rules tab, right click in Rules area and click Add Rule. 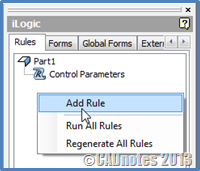 Give the rule name as Control Parameters in Rule Name Dialog Box. Let’s create the code. This code shows us what happened if user input incorrect parameter. 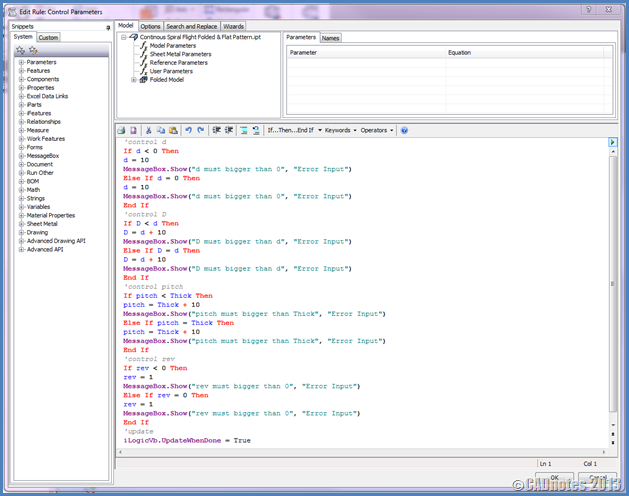 Imagine that if user input d less than or equal to 0, my model will error. That also happened to “D”, “pitch” and “rev” like we discuss before. Click OK button to finish. 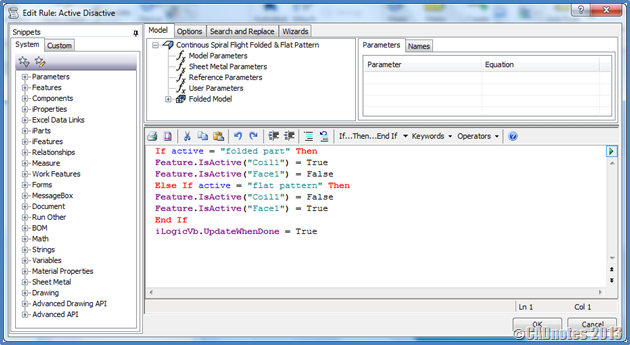 Do same thing as before, now we want to add iLogic to activate and deactivate (switch) folded and flat pattern model. 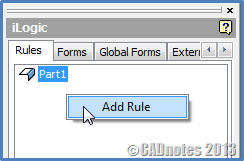 Give the rule name as Active Deactivate in Rule Name Dialog box. Let’s create the code, This code tell us if parameter “active” has value “folded part”, my Coil1 feature is unsuppressed and my Face1 feature is suppressed. That thing also happened if parameter “active” has value flat pattern my Face1 feature unsuppressed and my Coil1 feature is suppressed. With this code, I switch my model from flat pattern into folded model or vice versa. Click OK button to finish. Last, let’s try this file. If you want to do some exercise, try to automate the flat pattern of dishead. Here is the model you may need. I’m a student of Darma Persada University, East Jakarta and take Mechanical Engineering major. I know Inventor since 2009. It was so helpful for me. Hi Dwi, thank you for sharing such a great information. By the way are you still studying at Darama Persada ? 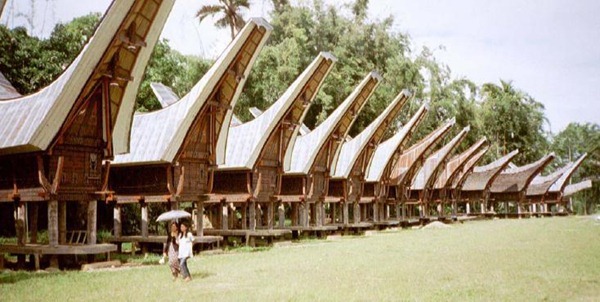 Thanks for sharing some more of your great work Dwi! I know a lot of people will appreciate this even if they don't comment. Would it be possible for you to post some sample files on this post, so people can download them and follow along with your tutorial? Maybe upload them to GrabCAD then link to them at the end of this post? Thank you again. 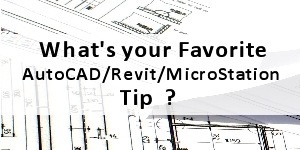 What is Your Favorite AutoCAD/Revit/MicroStation Tip?